Living your life every day without a moral compass is a recipe for disaster, you may well earn a lot of money and you may well have lots of material benefits, but you won't be HAPPY. To achieve true happiness, you'll need to set your star to guide you, you'll have illumination during hard times and you'll have a good moral sense of what is right and what is wrong. Maintaining your principals through adversity is a difficult goal to achieve, but many of history’s greatest figures have managed just that. You will face moments in your life when you'll need to reach deep down into yourself and question yourself. I'm proud to stand up at my kid’s school knowing I work hard every day changing lives and creating futures, by doing it the right way. I work in sales, recruiting people, an easy job you might think? Recruiting over a sustained period where everyone has a choice and it is a service led profession requires INTEGRITY and SYNERGY. In my industry people make huge changes to their everyday lives, so knowing you're being honest and doing the right thing makes a difference. What do you choose? 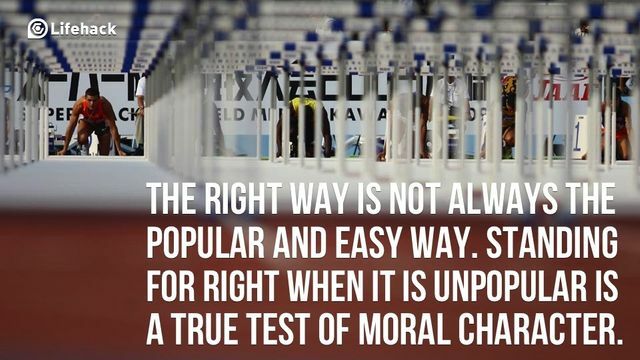 What’s your moral compass?